Yesterday I completed my first week working as a “shop girl.” Doesn’t that conjure images of a routine, mundane daily life? My week was anything but. For those of you who don’t have time to read the rest, here is the bottom line: Both F. Oliver’s and I had an excellent week! Thank you to all who made that possible. For those of you with a little time, following is the color commentary. If you are the only one minding the store, how do you gracefully visit the ladies room? So the store is empty at the moment, but it is guaranteed that the minute you duck into “the ladies” the bell on the door rings and one is left to finish thoroughly washing one’s hands and emerge, acting as if just coming up from the stock room, when everyone knows exactly where you are coming from. Oh well, at least “employees washed hands before returning to work” – and – I am cutting back on my morning coffee consumption. Ditto lunch. My first day in the shop alone I didn’t make time to pack a lunch in the morning. By about 1:00 I was getting more than a little hungry. For those of you who haven’t visited the store yet, picture this: the cash area is a beautiful high table behind which one sits looking out at Main Street, Canandaigua. 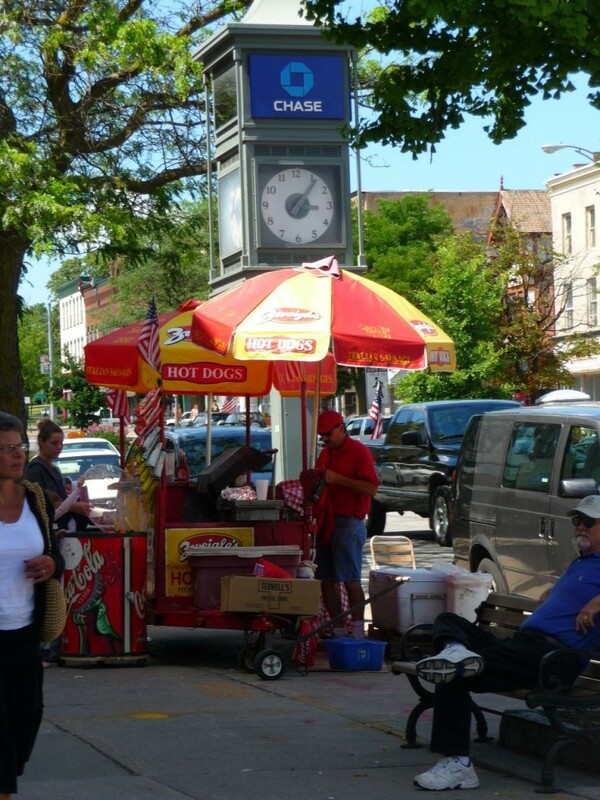 A fixture of decades on Main Street is Ken’s Doghouse, a renowned street stand selling some of the best hot dogs I’ve ever had. So here I am, starving, gazing at Ken’s Doghouse. After considering alternatives, I quickly put up the “back in 5 minutes” sign and ran over to Ken’s in my F. Oliver’s apron. During my 5 minutes at Ken’s, I experienced one of the most beautiful aspects of doing business in a small town. I ran into and chatted with my insurance agent, who introduced me to another Ken’s fan, George Hamlin, a big time local celebrity who is the President and CEO of Canandaigua National Bank, our incredibly well-run and growing “local” bank. I can’t wait to see who else I meet during future “back in 5 minutes” lunches. It is really important to open in an organized manner at 10:00 if that’s what your hours are. I decided to do a quick errand one morning before opening. I was walking back up Main Street when I realized that it was a few minutes after 10. I thought to myself, “Oh well, no one really knows that we are open and who is going to be there at 10 anyway?” Wrong – I got back to the store and found 2 people waiting. When we all entered together there was a ladder in the middle of the store. That was a great message underscoring the reality that the store needed to immediately exit its development phase and become more officially run as a business. There are two best parts to my new “job” at F. Oliver’s. As I mentioned earlier, my duties are varied and gratifying. I love “doing it all,” from figuring out the point of sale system to bottling product. Emptying the waste baskets and taking out the garbage isn’t bad at all either. At least you can see the results of your work. The other best part is that I GET TO MEET NEW PEOPLE EVERY DAY! It is really fun and rewarding to become acquainted with people and to help them become acquainted with our products, and, not surprisingly, everyone so far has loved the products! This entry was posted in Blog on April 11, 2010 by penelope.